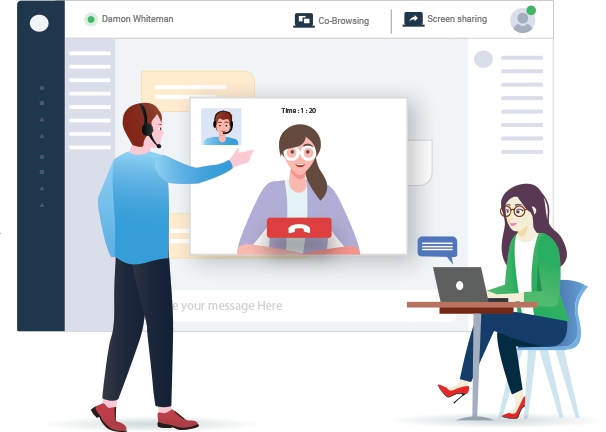 Let your customers have face to face video chat with one click for real time sales and support assistance. 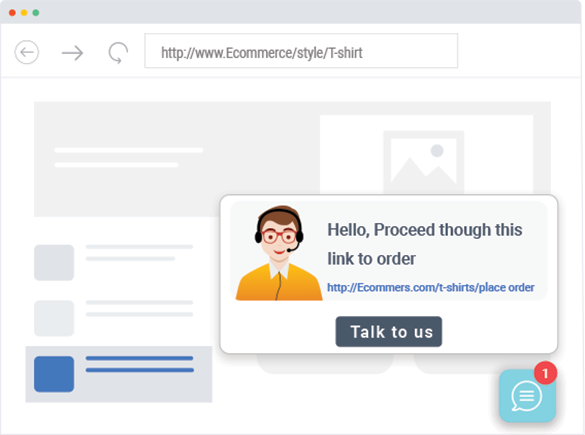 Interact with your customer’s browser screen in real time to resolve queries through meaningful conversations. Provide real time help to your website visitors and customers with a modern live chat messenger. Add video and voice functionality to your iOS and Android apps by using REVE Chat’s mobile SDK. 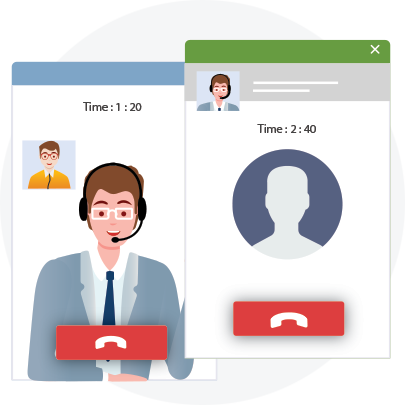 Live chat enables you to connect with the customers whenever they need. 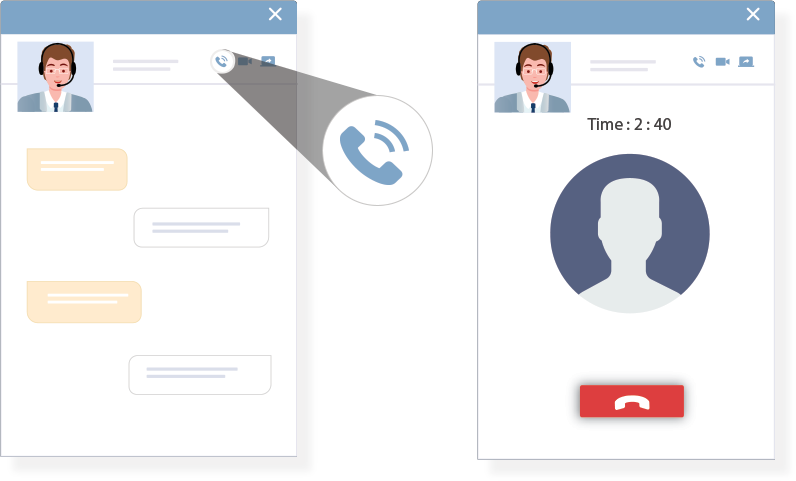 Assures quick resolution to the customers, builds trust through personalized chat sessions, and convert website visitors to loyal customers. Effectively collaborate with the customers for productive training and support. Guide customers remotely anywhere at any given time. Enables better understanding to customers by sharing screen with the agents. 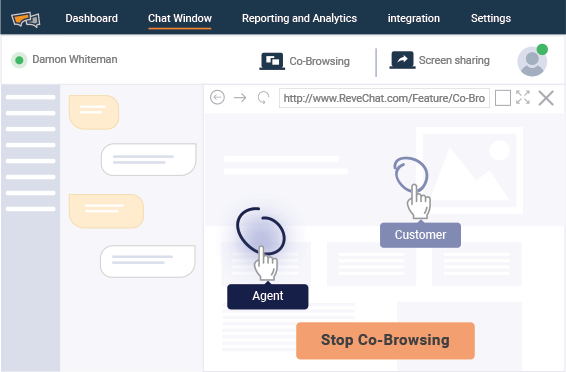 Integrate REVE Chat Developer API and start chatting in just a few clicks. Deliver better customer engagement with chat functionality and improve customer experience. Create an integrated customer experience no matter how or where your customer reaches out. Provide unified support under a single platform by streamlining all the conversations across different channels. Leave internal notes or comments for other agents to review the conversation and further follow up. Add meaningful data about customer query for internal reference with your other team members. Gain insights about your customers like from where is the visitor coming, total time spent on a particular page, most visited pages, previous chat history. Attend your customers quickly by identifying the problem and resolving them in minimum time. Customers look for quick response and prefer one-on-one help offered by video chat. Get in touch with your customers instantly and guide them in quick decision making. Video chat helps in personalizing the sessions and save customers from tripping out. Exceed your customer expectations by personalizing conversations with live engagement tools. It develops trust in customers and builds long lasting relationships with your business. Accelerate your business sales conversions by guiding your customer throughout the buying journey. Good customer experience develops trust and loyalty among customers opening scope for future sales. Customize your live chat widget to match your company’s branding and help your visitors to navigate your website. Set personalized welcome greetings and pre-chat messages with your branding and business information. 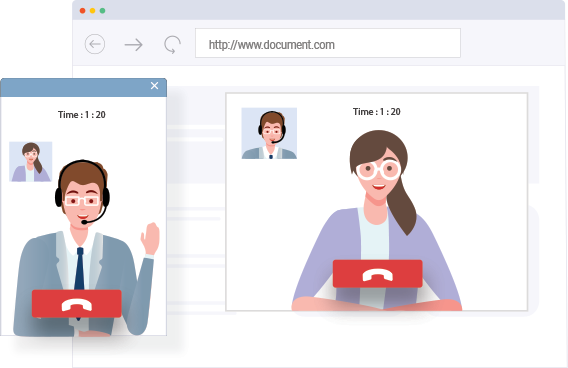 Improve team efficiency and productivity with video chat, live chat, and co-browsing software. It improves the first response time, boost customer satisfaction and overall customer experience. Prevent unrestricted access to your chats and allow chats from the domains are authorized and trusted by you. Restrict the access from domains which are not authorized to stop anyone from any misconducts. Set predefined responses for the commonly asked questions by the customers. Canned responses can be used during the chat sessions to improve the quality of customer service and overall response time. Trigger right messages to your customers at right time. Analyze the customer’s journey and send personalized messages based on it. Make customer conversations effective with advanced chat routing options for your agents and teams. Deliver a better experience to your website visitors by efficient chat distribution. What is video chat software for customer support? Provide remote support to your customers at a single click anytime anywhere. Take control over your customer’s browser with live engagement tools and assist effectively in real time. Make your customers aware of the in-depth details about the product such as functionalities and features. Product demos have a positive impact on sales. Customer interaction with video chat builds trust, improves sales and gain repeat customers. Sustain your customer loyalty for more referrals. Provides seamless customer service by reduced drop rates of help desk tickets. to improves the team KPIs as customers do not need to raise support.